Anne Robertson lived from 3 May 1910 to 4 October 1997. She was an archaeologist and museum curator. The wider picture in Scotland at the time is set out in our Historical Timeline. Anne Robertson was born in Glasgow and brought up alongside her three sisters. She attended the University of Glasgow, where she studied classics, and then went on to study archaeology at the University of London. While there she took part in a number of excavations of Roman sites in England under the direction of Sir Mortimer Wheeler. She went on to work at the British Museum, where she specialised in numismatics: the study of currency, including coins and tokens. 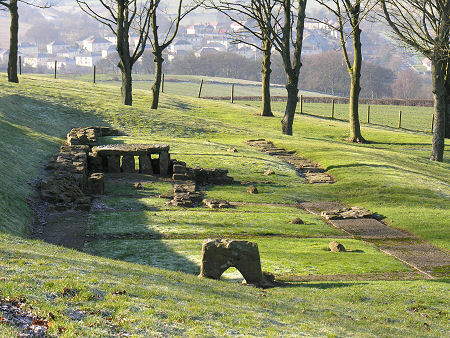 Back in Scotland she worked on the excavation of a number of Roman sites along the Antonine Wall such as the Barr Hill Roman Fort. She also worked at the Hunterian Museum in Glasgow as a numismatist, cataloguing the coin collection there. In 1952 she became assistant to the Keeper of the Hunterian Museum. At a less formal level she also took part in the Glasgow Archaeological Society and the Scottish Field School of Archaeology. In 1974 Anne Robertson was appointed to be Professor of Roman Archaeology at the University of Glasgow. She retired the following year, and died in 1997. During a distinguished career she had become a Fellow of the Royal Society of Edinburgh; a Fellow of the Royal Society of Antiquaries; a Fellow of the Royal Society of Antiquaries of Scotland; and a Fellow of the Royal Numismatic Society.